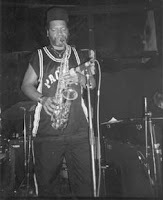 Citing a broadcast by the NYC public radio station WKCR, NPR's A Blog Supreme has posted an item saying that saxophonist Luther Thomas has died. The St. Louis native and former Black Artists Group member (pictured) has lived in Copenhagen, Denmark for a number of years, and at this point there don't seem to be any obituaries or other fresh news stories about him anywhere online, in either English or Danish. There are two other sources that confirm the news of his death, though. First is Thomas' Wikipedia page, which now says "Luther Thomas was born on the 23rd of June 1950 and passed away on Tuesday 8th of September 2009." Also, Thomas' MySpace page shows a number of messages posted over the last three days with condolences and/or remembrances, including notes from musical colleagues and family members. Thomas' discography includes the cult favorite Funky Donkey, a archetypal example of the way St. Louis musicians of the late 1960s and 1970s mixed funk and free jazz. Fronting the slightly more commercial funk band Dizzazz, Thomas had a semi-hit single in 1981 with the songs "Nervous Breakdown/Six Months In Reform School." He also recorded with Defunkt and James Chance (aka James White) and the Contortions, and was a co-leader of the Human Arts Ensemble, whose out-of-print album Junk Trap was recently posted for free downloading on the music sharing blog Music Hertz. You can see some video of Thomas playing and talking on his YouTube channel here. Thomas is also pictured and discussed in this article about the early 1980s scene at NYC's Squat Theatre, which served as a performing venue for Defunkt, Chance and similar punk-funk artists. Our condolences and sympathies go out to Thomas' family, friends and colleagues. I am finding this hard to believe. I had the greatest respect for the man and the musician. I was hoping to meet up with him this year but due to work, was not possible. I am very surprised to hear this. I will always hold in memory his music, thoughts and words from my association with him as tour manager of James Chance (which Luther played with during the tour) in 1996. My condolences to his family. Georgia...I am wordless. We will meet again Luther...one day...one day. Tonix. I had the pleasure to meet Luther Thomas in Rome, 1977. He was play with Bobo Shaw Art Ensamble. We spent few nights play togheter...in the street, in pubs. Wild lovely experience indeed. That is what I will remeber about you. So man, have good luck and thanks for all that notes. Sincerely Tonix J. Do you know where he is buried? Will be in Copenhagen in about a week. Jeff MacGyver, I don't have any information about where Luther Thomas is buried. Sorry about that. Perhaps local authorities or jazz fans in Copenhagen may be able to help, but information about Thomas' last years there has been hard to come by here in the US.